So in the everyday testing/jailbreaking process we run into a multitude of issues and errors. Mainly the errors occur when trying to restore to custom firmwares or downgrading existing firmwares. Always ending up in recovery mode (Connect to iTunes and the plug). Some errors you can’t avoid or kick out of (i.e error 1600 ), but the 1015 error you get from trying to downgrade, you can using a tool called iRecovery. Which involves cmd line and some typing of cmds that are not always easy to remember. Well, Windows users we got a new tool for you: Called “Error 1015 Fixer”.Its a one click and you’re done deal. Nothing super exiting here, other than its just a dead simple way to get out of recovery mode. Packaged up by a regular in the iH8sn0w IRC channel CJ ( @penguinz1). It doesn’t get any easier than this. 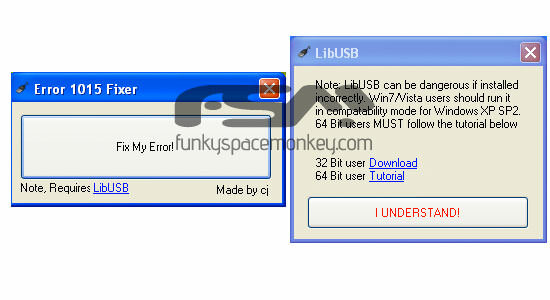 Even includes links to the libUSB that you need to use the tool. Now, before you start emailing that this doesn’t fix error 1600 and get all in a tizzy. the tool is called Error 1015 Fixer…not Error 1600 fixer..try iREB for that.